Because the Modena HE boiler is so reliable we’ve introduced a 7 or 10 year warranty upgrade to the standard 5 year option, so you can now give your customers even more peace of mind. Here’s a quick explanation of how it works. All Modena HE boilers come with a 5 year warranty as standard. 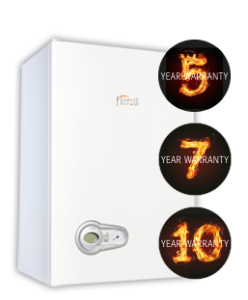 To upgrade to 7 or 10 years you will need to buy a Warranty Upgrade Pack from your merchant at the same time as buying the boiler. Inside this pack you will find a unique number – this represents your warranty upgrade. Remember, you can only buy a warranty upgrade at the same time as buying the boiler. A warranty upgrade cannot be added after the boiler has been registered. To register the warranty you will need to be a member of our loyalty club Installersmate. If you haven’t joined already, visit www.installersmate.co.uk and see the great benefits you’ll enjoy, including free notifications. After installing the boiler for your customer, log into your Installersmate account and make your notification. As part of this process you will be asked to enter the serial number of the boiler. If you have purchased a standard 5 year warranty boiler this length of warranty will be recorded against the notification. If you have purchased a warranty upgrade pack this is when you will be asked to enter your unique number. This will register the correct warranty length against this notification. Installersmate will generate and dispatch the warranty certificate to your customer. Worth noting – every Modena HE boiler comes with an instructions card on how to register your warranty; these instructions apply to a standard 5 year warranty only. If you have purchased a 7 or 10 year warranty upgrade you can dispose of this card. Standard 5 year warranties can be registered via Installersmate and also via Domestic & General or by phone as normal. If you have any questions please get in touch, we are always pleased to hear from you and happy to help.